NUMO Toilet Seat Arms base plate is manufactured from high tensile 8 mm thick steel which is zinc etched and plastic coated in appliance white. NUMO Arms are manufactured from high impact Nylon reinforced polymer in white to match most toilet accessories. Maximum Recommended Loading 150 Kg. NUMO Toilet Arms are secured to the pan with Nylon or metal fixing bolts normally supplied with the toilet seat. NUMO Base Plates feature two slotted holes to the rear based on the Australian Standard of 155mm for toilet seat fixings. There is some room for adjustment. Please check measurement before ordering as some US pans differ from this dimension. 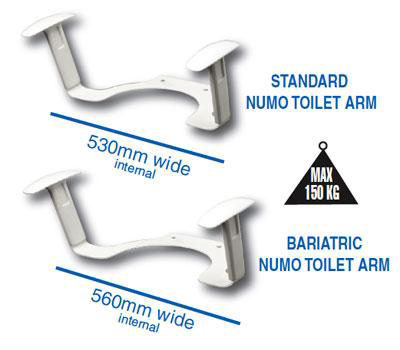 NUMO Toilet Arm systems have been structurally tested by a certified testing authority for static durability loadings to a maximum of 150 KG [standard and Extra Wide models] and comply with Type A Domestic and Institutional use AS 3973: 2005 – AS 4688.2 and [ISO 7173]. NUMO Toilet Arm base plates were subjected to a 1000 hour salt spray test by a Certified Testing Authority and comply with Type A AS 2331.3.1 for application in bathrooms, showers and toilets. numoarm.com.au 2019 Copyright © All Rights Reserved. Numo™Arms is a K Care Healthcare Equipment brand.